Back at the turn of the millennium, Shon Taylor and Ray Chiles were looking to make something out of the technologies then evolving all around them. They could see how the advent of the computer was creating a new approach to graphic arts, but so could a whole lot of aspiring artists, so they knew when they set out to integrate graphic design with the software to make it, their start-up, Bottle Rocket Mfg, would have at best a brief window before the rising tide swamped them. Three years later came 24tix, a strictly online source of tickets for events and concerts. By then, Bottle Rocket Mfg had morphed into a software source only. Ten years ago, they briefly considered supplementing 24tix with an online art gallery. But by then, Taylor and Chiles were beginning to miss the human contact that art and music had traditionally featured, and they began to scheme on starting something that would put them back in touch with their customers while making sure their customers got up close and personal with their products. A decade of scheming has finally let to God Hates Robots, primarily an art gallery, but also a ticket outlet for those who share their old-fashioned preferences. On Friday, May 15, during Gallery Stroll, the culmination of 15 years of work will open for business with an inaugural exhibit functionally curated by Trent Call, under the guiding spirit of Captain Captain. Presumably, anyone could say their gallery is about art rather than money, but none we know of could demonstrate, as God Hates Robots does, such a clear preference for the virtues of owning art rather than trafficking in it. Talking to Taylor, you get the impression he’d love to find a way for people to buy art that didn’t require him to sell it to them, so long as they got the clear cut benefits of living with it. The gallery’s mission statement, as explained on its web page, includes limiting prices to $400, 80 percent of which will go to the artist, and featuring emerging artists and new bodies of work—two generally affordable kinds of art that rarely show up in conventional galleries. By now, it should be obvious that ‘convention’ will not be a featured attribute of God Hates Robots. Although only a third of the works selected were available to preview, the overall standard was quite high. Sharply-executed graphics and engaging subject matter were much in evidence. 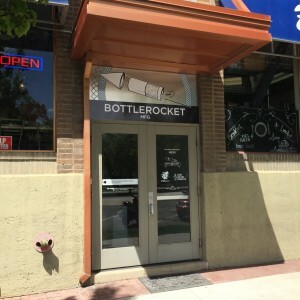 The location, a block from Rio Gallery and two from Art Access and the Utah Arts Festival, across the street from Pioneer Park, should make God Hates Robots easy to include in any arts-oriented escapade. The entrance is between Carlucci’s Bakery’s two street-side windows, up a flight of stairs. Don’t miss the swooping bird in the stairwell. 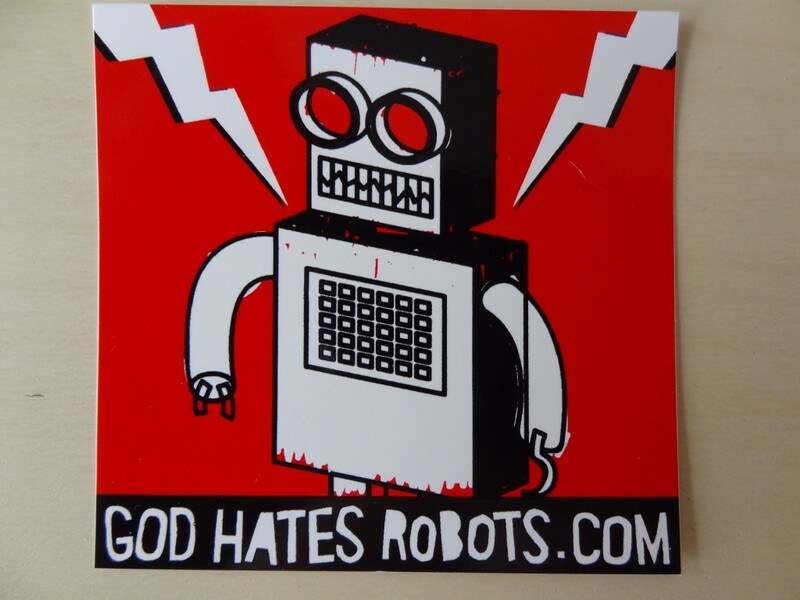 God Hates Robots is at 314 West Broadway, Suite #250 Salt Lake City, Utah 84101. Their inaugural exhibit opens Friday, May 15, 6-9 pm and continues through June 12. Smartly written, concise story about a terribly needed gallery concept. Great target audience — next generation of art buyers that is usually, sadly priced out of the “real” art market (though they often can do time payments). Problem is, getting that $400 piece of art framed likely is going to cost as much as the work itself (smile). Maybe Travis Tanner will be able to coordinate here with a Robotic line of frames?